It appears that the connection between Neith and the primeval cow has several impolications. Neith is not only a primeval deity but also a goddess of the universe. An echo of the conviction that she exercises the latter function can be heard in the inscription on her statue in Sais, as it is quoted by Plutarch: ["The present and the future and the past, I am. My undergarment no one has uncovered. The fruit I brought forth, the sun came into being."] Her quality as primeval deity is indicated in the explanation of her name which Plutarch offers, i.e.... "I came (into existence) out of myself."... It is confirmed by a line in the myth of creation at Esna, which reads: "apparue d'elle-même" ["appeared from herself"]. 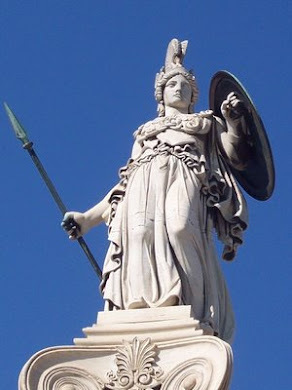 It should be recalled that Neith is identified in antiquity with both the Greek goddess Athena, who is likewise a parthenogenetic creatrix or virgin mother, as well as Isis, about whom the same can be and is said. Among others, Isis is identified with the constellation of Virgo, the Virgin, likewise in antiquity. There are many such manifestations of the virgin mother, long before Christianity was ever conceived.